The NCCA has been leading the celebration of NAM every February since the signing of Presidential Proclamation 683 in 1991. The activities and events are spread out from Luzon to Mindanao, comprising performances, exhibits and workshops. Several projects are festivals of different art forms, involving several activities. This year, the opening program will be held the whole afternoon of February 1, 2015, at the Rizal Park’s Open-Air Auditorium in Manila. Visitors can join the pocket workshops on drawing and caricature-making while short films and documentaries on Filipino architecture will be shown in the afternoon. In the evening, people will be able to watch performances of Novo Concertante, Sinukwan Kapampangan Performing Arts, Xtreme Dancers from South Cotabato and Halili Cruz School of Ballet. An excerpt of a komedya, an old Filipino theater form, will be mounted as well as a balatagsan, the Tagalog poetic “joust,” and a modern rap session, at the Concert at the Park venue of Rizal Park, in partnership with the National Parks Development Committee. On the other hand, the closing ceremony will also be at the same venue on February 28, 2015 at 6 p.m. featuring performances by Novo Concertante, Sinukwan Kapampangan Performing Arts, Xtreme Dancers, A Team and guests representing the different arts. All Saturdays and Sundays of February will also be filled with performances at the same venue. 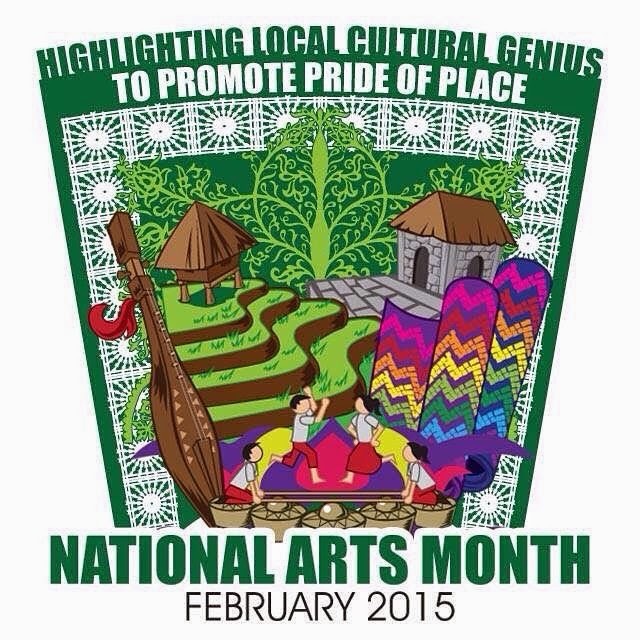 The NCCA’s NAM celebration will be highlighted by the Ani ni Dangal awards, which will happen on February 12, 2015, at 6 p.m., at the Old Senate Hall of the National Museum of the Philippines. It will be headlined by iconic actress and politician, Gov. 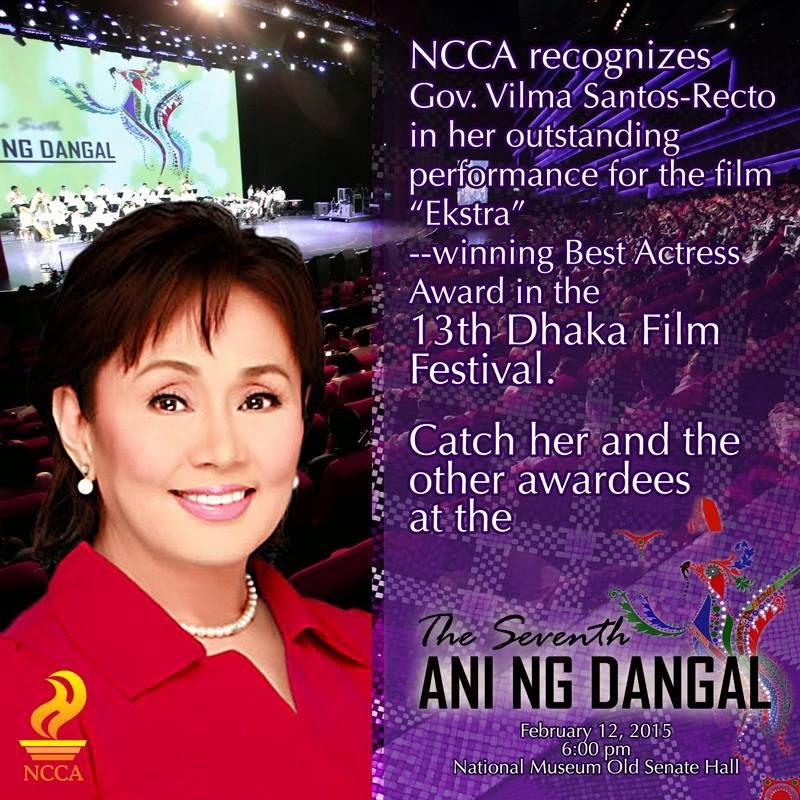 Vilma Santos, who won the Best Actress trophy at the 2014 Dhaka International Film Festival for the Jeffrey Jeturian film Ekstra. Ronnie Dayo, Robert John Cabagnot, Glenn Isaac, Mario Cardenas, Kenneth Cobonpue, Jophel Botero Ybiosa, Gina Meneses, Phoebelyn Gullunan, Jamille Blanca Aguilar, James Singlador, Danilo Victoriano, Ruston Banal, Trisha Co Reyes, Justen Paul Tolentino, Jamia Mei Tolentino, Jesus Ramos Tejada and Maria Angelica Tejada for visual arts. Photos of the awardees’ trophies, clippings and ephemera will be featured at the Ani ng Dangal exhibit, which will be unveiled at the event. The exhibit will also be mounted at the SM North Edsa from Feb. 13 to 20, SM Megamall from Feb. 21 to 27, and at the Rizal Park at Feb. 28. For more details, contact Rene Sanchez Napeñas, head of the NCCA Public Affairs and Information Office (PAIO) at 0928-5081057 or 527-5529. E-mail us at ncca.paio@gmail.com or visit our website at www.ncca.gov.ph.